The picture shows a shallow irrigation channel (yōsuiro) running alongside the larger Tamagawa Aqueduct featured in an earlier post. 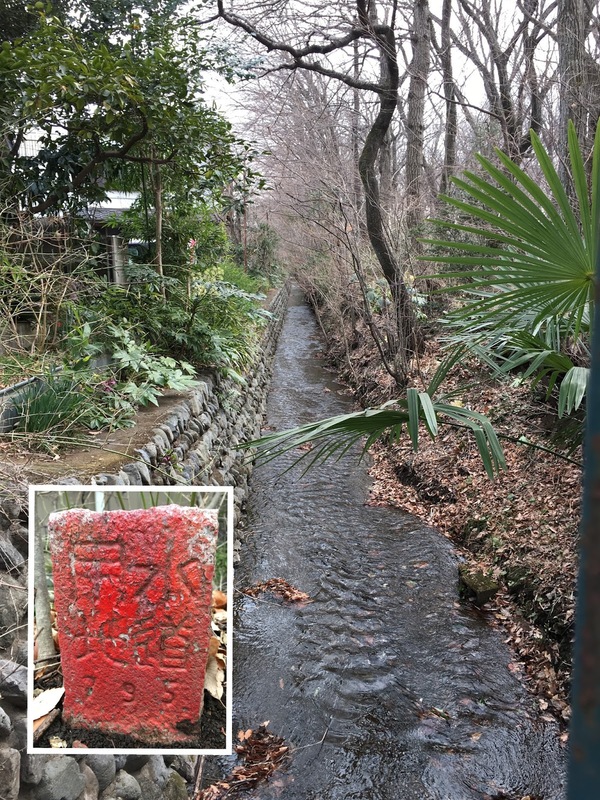 The availability of fresh drinking water from the Tamagawa River saw a number of villages sprout up after the Aqueduct was built, the first being Ogawa Village in 1656. Water was of crucial importance for the villagers who were strictly prohibited from throwing garbage, bathing, or washing clothes in the channel. They also had to drain and clean the channel twice a year - a practice which still continues today - and local children then as now enjoy gathering the small fish and zarigani (crayfish) that appear when this happens. See here for a simple Japanese pamphlet on the history. 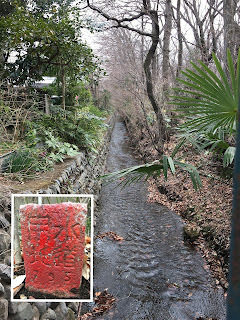 Every 100m or so there are barely visible numbered red markers (inset) in the ground marking the path of the channel and reading suidōyōchi (water supply site). Today, of course, water no longer has to be hauled from the channel, as children had to do each morning in the past, though the source and quality of the water remains the same. Tokyo tap water is safe to drink and is softer and milder than the tap water in many other countries. something which makes it perfect for making Japanese noodles, dashi (soup stock), and tea. On entering a restaurant you are invariably brought a glass of tap water and a wet towel (oshibori) along with the menu. Bottled Tokyo tap water is a popular souvenir and can be bought for ￥100 a bottle at the Tokyo OmiyageCentre in the labyrinth that is the First Avenue underground shopping mall at Tokyo Station. Travellers coming in the summer months though may encounter more water than they bargained for: the rainy season runs from early June to mid-July and typhoons peak around August/September.